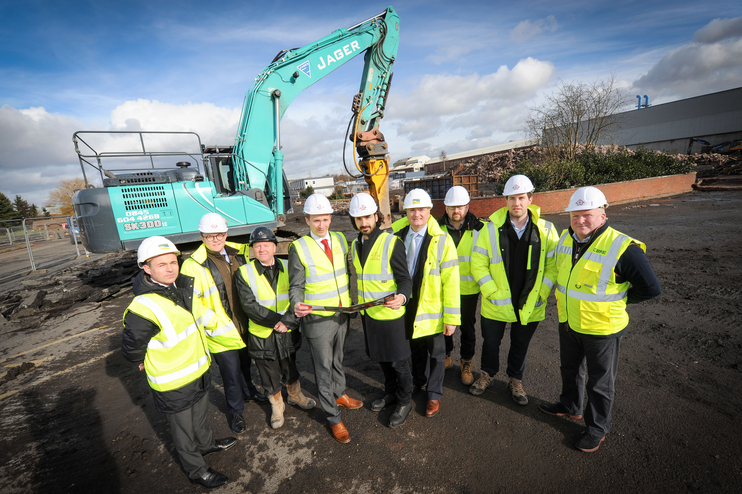 To celebrate A&H Construction’s appointment to deliver the multi-million redevelopment of Vaughan Park in Tipton, Councillor Paul Moore joined CEG at a ground breaking ceremony. Halesowen based A&H Construction started work on the 28 acre site last week and the units will be ready for occupation later this year. John Maley, from A&H Construction, said: “As a local business we are proud to be involved with this formidable project, our aim is to build on the relationships we have with the local supply chain to ensure this project is delivered as planned and exceeds expectations.” This first phase of units will offer an unrivalled specification with 8 metre internal heights, separate yard and parking in a well-landscaped environment with 24 hour security, CCTV and gatehouse entry. CBRE and Bulleys have been appointed as agents to market the site. Issued by Victroia Walker @ CEG.